The various Hunts came out on Boxing Day - BBC 26th December. 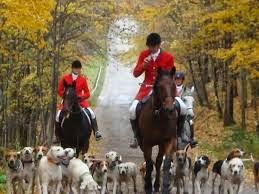 Twitter came alive with comments that, if they have a majority after the 2015 general election, the Conservative Party would, at some stage, allow a free vote on whether the Hunting Act 2004 should be repealed. The Act does not prevent hunting other that of wild animals with dogs and even that is lawful if carried out in accordance with the conditions of an exemption. Section 1 makes it an offence for a person to hunt a wild mammal with a dog unless the hunting is exempt. Exempt hunting is dealt with in Schedule 1. Perhaps the most interesting of the nine exemptions relates to Stalking and Flushing Out. Provided that 5 conditions are met, stalking a wild mammal, or flushing it out of cover, is exempt hunting. The third condition limits to a maximum of two the number of dogs used in stalking or flushing out. The fifth condition requires the animal stalked or flushed out to be shot dead by a competent person in the event that the stalking / flushing out is successful. Section 4 creates a defence where the defendant shows that he reasonably believed that the hunting was exempt. Section 3 creates offences of assisting hunting - for example, by knowingly permitting the use of land. Note - read section 3 in conjunction with section 11(3). The penalty for an offence under the Act is a Level 5 fine and the offences are summary (i.e. triable by the Magistrates' Court). One interesting fact about the Hunting Act 2004 is that it was enacted using the Parliament Acts 1911-49. This led to an interesting challenge heard in the House of Lords - Jackson v Attorney-General  UKHL 56 where it was argued that the Hunting Act 2004 was legally invalid because the Parliament Act 1949 was also invalid having been enacted using the Parliament Act 1911 which did not permit an Act such as that of 1949 to be enacted without the consent of the House of Lords (as a legislative body). This ingenious argument was rejected. "The issue of hunting is a contentious one and this was reflected in the debates during the passage of the legislation through Parliament. Prosecutors review all cases in accordance with the Code for Crown Prosecutors to determine whether there is sufficient evidence to provide a realistic prospect of conviction and, if so, whether a prosecution is required in the public interest. This is the Full Code Test which is applied to offences under this Act." A number of prosecutions brought under the Act are referred to in this Wikipedia entry. The relevant - (and different) - Scottish legislation is the Protection of Wild Mammals (Scotland) Act 2002. See the archived material on the older website of the Department for the Environment, Food and Rural Affairs. There is no doubt that the Hunting Act 2004 is controversial but, for all the problems inherent in the legislation and with enforcement, it currently represents the law on the subject. The present coalition government had a similar plan to offer a free vote in the House of Commons on this matter. For political reasons, the vote has not taken place to date. One wonders whether a future similar promise will meet a similar fate? DPP v Wright  EWHC 105 (Admin) where the Administrative Court gave a restrictive interpretation to the Act ruling that the term 'hunts' under the Act does not include the mere searching for an as yet unidentified wild mammal. Hence once a hunt begins, only a person who engages or participates in the pursuit of an 'identified' wild mammal is guilty of an offence. It was a waste of Parliamentary time on a non-issue. I believe that the species to be protected are prescribed by SI rather than listed in the statute. A new SI could issue replacing the list with some mammal that is not found wild in this country or which nobody wants to hunt anyway. And this silly little piece of class spite masquerading as law can then be forgotten. Was this entirely right? A mother's dilemma.